By Joe Meyer, a freelance writer from Westerville, Ohio. Zafar (right) greets students Payton Brummett ’22 (left) and Cooper Berry ’21 at his Robert L. Milligan Leaders in Business lecture on campus in October. In October, Shadman Zafar ’94 flew back to Delaware to give the Robert L. Milligan Leaders in Business lecture. As Citibank’s global head of digital, based outside Dallas — leading engineers, designers, product managers, and industry analysts to create, develop, and deploy digital financial services — he has plenty of business acumen to share. But over a lunch with students, Zafar’s conversation turned toward his roots. He started chatting with Sophia Ahmed ’20, an Entrepreneurial Scholar and Woltemade Center Economics Management Fellow. In talking, the two Bishops separated by 25 years learned that they had attended the same high school – in Pakistan. Such small-world connections are common when tracing Ohio Wesleyan’s ties to the South Asia country more than 7,500 miles away. Ahmed and Zafar both attended the Karachi Grammar School, a private school that, like many top-tier schools in Pakistan, features instruction in English. One of Ahmed’s instructors was her literature teacher, Siham Gheewala ’10, who encouraged her to apply to OWU. The draw of OWU’s management economics major and a scholarship sealed the deal for Ahmed. On a recent admission recruiting trip to Pakistan sponsored by EducationUSA, the U.S. Department of State network of international student advising centers, OWU Director of Admission Josh Stevens was struck by OWU’s local name recognition. Usman Javaid ’10 came to Delaware from the prestigious Aitchison College Lahore, a boarding school known for producing prime ministers and other high-ranking governmental officers across Pakistan. Javaid recalls that when he came to OWU, two other Aitchison grads were OWU seniors. “We have lots of alumni from my high school that regularly go to Ohio Wesleyan,” he says. The admission data bears this out. For the 2018-19 school year, 95 traditional international students from 35 countries are enrolled at OWU, and 25 of them come from Pakistan. This makes OWU something of an anomaly in the United States. Nationwide, Pakistan stands 23rd among countries sending students stateside to study. China and India take the top spots, accounting for roughly 33 and 18 percent, respectively, of the total 1.1 million international students for the 2017-18 academic year. Pakistan’s 77,000 students accounted for 0.7 percent, according to the 2018 Open Doors Report from the Institute of International Education. Darrell Albon, administrative director of the OWU Connection programs and director of OWU’s international and off-campus programs, says Pakistan’s representation at OWU is a long-standing tradition. “Pakistan is always, always in the top three, going back at least 20-25 years,” he says. The University appreciates and pays close attention to those historic ties, says Stefanie Niles, OWU vice president for enrollment and communications. “It’s a high priority for us to continue those relationships, because they do go back beyond our time on campus,” Niles says. On his recent tour, Stevens was joined by representatives from approximately 40 other schools, including Kansas State University, DePauw University, and the University of Buffalo. 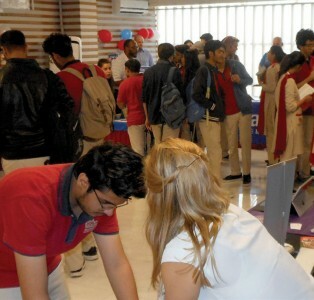 Getting to Pakistan took some effort and visa help from EducationUSA. But in these challenging times for higher education, when schools including Ohio Wesleyan are facing shrinking enrollment, recruiting “creatively” can pay off. “If you can find a recruitment niche in one of these countries that’s not a terribly open country, there’s a competitive advantage in that,” Stevens says. And yet some culture shock is inevitable when transitioning from an Islamic republic and cities like Karachi, one of the world’s largest. “Karachi really is a very metropolitan city and it’s very fast paced, so (arriving in Delaware) you suddenly feel a little bit of a shock,” says Moomal Shaikh ’13, who first heard about OWU from friends back home. Slowing to the pace of a tight-knit campus in a small Ohio city, though, came comfortably and quickly for her, aided by thorough orientation activities for international students that included stops like opening a checking account at a local bank. “You’re not consistently feeling like a stranger in a place that, automatically you do tend to feel like a stranger when you first show up there, after going across the world and starting a whole new chapter of your life,” Shaikh says. Ibrahim “Ibs” Saeed ’15, the product manager of digital payments for JPMorgan Chase in New York City, also came to OWU from Karachi. A cousin who went to Northwestern University had friends who raved about OWU. Once on campus, Saeed says he never felt like an outsider, especially after he joined Sigma Phi Epsilon fraternity. “I was in a frat filled with all our baseball players. It doesn’t get more American than that. They were the most welcoming guys in the world,” he says. Saeed eventually earned the endorsement of his entire class when he was voted onto OWU’s Board of Trustees, a post he held until last year. His fellow students not only made him feel at home on campus, but during breaks as well. 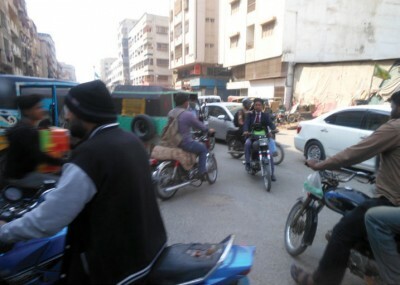 With travel home to Karachi for school breaks out of the question, his friends invited Saeed to spend holidays in the States with their families. And when it came time for graduation, with hotel rooms in the area scarce and a large family contingent traveling to OWU for commencement, a professor offered a room in his house to put up Saeed’s relatives. Such personal interactions made a mark on him. “It seemed that everybody was very sensitized to this influx of international students, where there was this great allowance for different styles of thinking and different styles of being,” Javaid says. 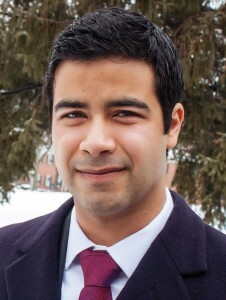 After OWU, Javaid earned a master’s degree in public policy from Harvard’s Kennedy School of Government and has held a number of jobs focused on public policy and data analysis of international development, including posts with UNICEF and US AID. He’s worked for the World Bank Group since late 2012. He started in the Washington, D.C., area, but in late 2017 he found his way back closer to home, as operations officer at the World Bank offices in Islamabad. 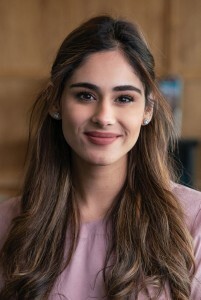 After discovering their Karachi connection and her interest in business, Shadman Zafar encouraged Sophia Ahmed to apply for an internship with Citibank in Dallas, for which she was later chosen. This summer, she will work on financial forecasting, financial analysis, and the budgeting side of a team’s tech project proposals. Instances of OWU alumni helping OWU students and other alumni aren’t limited by country of origin, of course. While majoring in economic management with a focus in marketing, Moomal Shaikh had an externship in digital marketing in New York City her senior year through Bill Jennings ’84. Jennings hired her following the externship to do research part-time while she was still a senior. “Every time I have a current student call me and ask for job advice or something, I tell them, ‘Don’t underestimate the alumni network.’ The alumni network has been absolutely vital in my own growth,” Shaikh says. For her part, junior Ahmed says that after graduation, she hopes to remain in the States to pursue a master’s degree in finance or financial decision-making. After maximizing her education in the United States, like Javaid, she plans to return to Pakistan to put it to work. “At the end of my career path, I do want to go back to Pakistan and take what I’ve learned and make a change any way that I can,” she says. “When I think about where I stand right now in terms of knowing what I‘m doing this summer, knowing what I’m doing when I graduate, I don’t think that I would be this clear if I was at another school. I will definitely recommend OWU to people back home,” Ahmed says. All multicultural and international alumni and their guests are invited to a special reception at 5 p.m., Friday, May 17, during Reunion Weekend.See owu.edu/2019rw for more information.